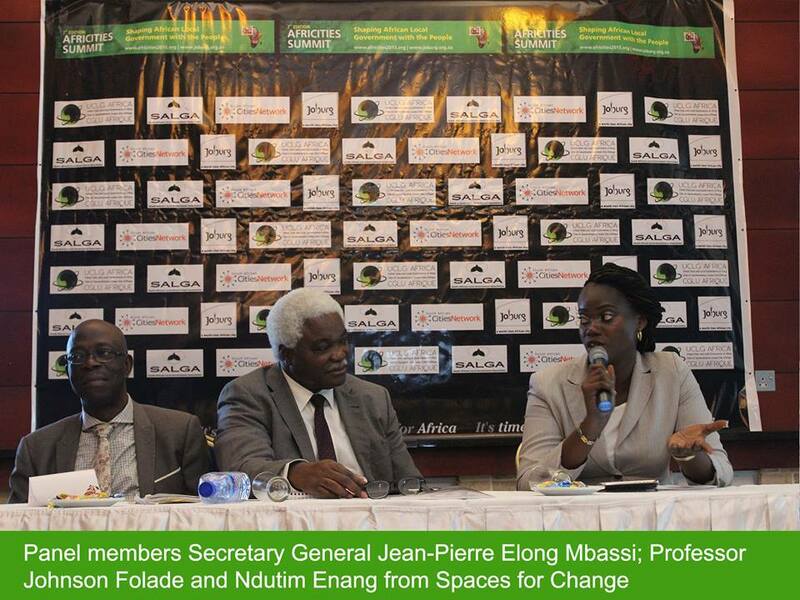 “The time has come for Africa!” That was the theme of the Press Conference on Africities VII Summit held on Friday, November 7, 2015 in Lagos, Nigeria. The United Cities of Local Governments of Africa, UCLGA, summit slated to hold between November 29 and December 3, 2015 at the Sandton Convention Centre, in Johannesburg, South Africa promises to be the local governance platform for reshaping the future of Africa with the people, and increase Africa’s local government contribution to the Africa 2063 Vision. The summit is held every three years. This year, more than 5,000 participants are expected from across Africa and the globe, and over 25 open sessions for stakeholders ranging from the World Bank on one side, to slum dwellers on the other. 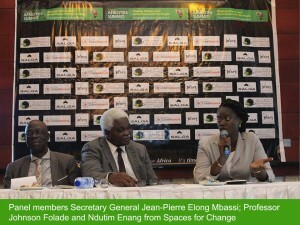 Three panelists – Ndutim Enang, Head of Communications at Spaces for Change, Secretary General of the UCLGA, Jean-Pierre Elong Mbassi, and Professor Johnson Falade, Chief Planning Specialist formerly at UNHABITAT – spoke at the Press Conference on the theme of community empowerment, urban inclusion and decentralized governance of urban spaces in Nigeria. Ndutim Enang decried the systematic pattern of forced evictions in Lagos State, particularly targeting slum communities, which often results in large-scale displacement of the urban poor and massive violations of human rights. Particularly objectionable is the due process breaches and non-inclusive project execution approaches that characterize the state’s urban renewal interventions. Ms. Enang also emphasized the role of the media in advocating for local participation and better local governance. Evictees of the September 18, 2015 demolition in Badia East community in Lagos, who were rendered homeless at the peak of torrential rainfall, accompanied Ndutimobong Enang to the event. They shared experiences of the great suffering resulting from the recent demolition exercise in Badia, including the environmental and health hazards that women and children continue to face as a result of sleeping in open spaces, near their demolished homes. Jean-Pierre Elong-Mbassi discussed the conditions needed to “bring the development and improvement of Africa closer and why the Africities 2015 Summit is an important rallying call towards the realization of Agenda 2063.” The Secretary General and the panel members urged all Africans, especially women and youth, to act and participate in local elections and the development and the future of their cities and their lives.